This morning we had a special visitor to kindergarten - Hoop Lady. Children spotted her out the gate coming toward kindergarten with all of her hoops in hand. Alice was running around telling everyone she had arrived, so we welcomed Hoop Lady and helped her inside with all of her hoops. 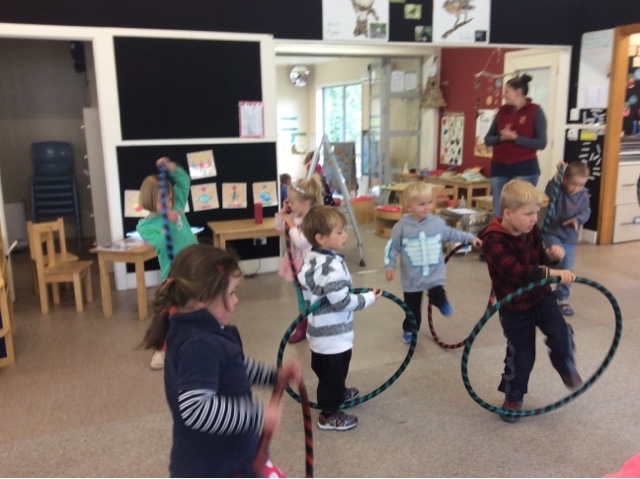 Together we joined in on a warm up, to warm up our muscles and prepare ourselves for some exercise with a hoop each! 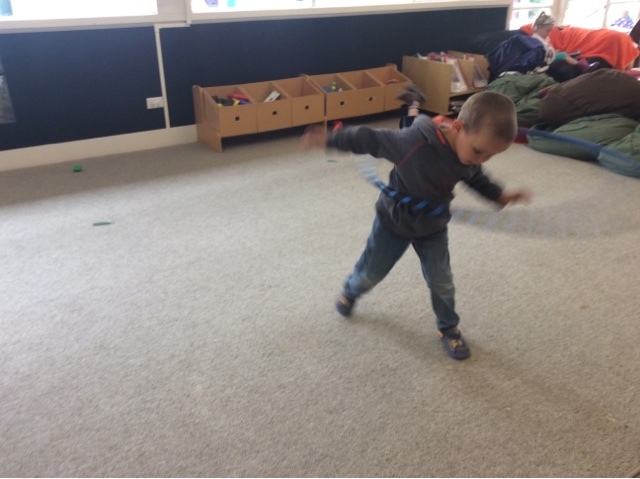 Initially we experimented with the different ways we could use a hoop, stepping in the middle, on different parts of our body and around out body. 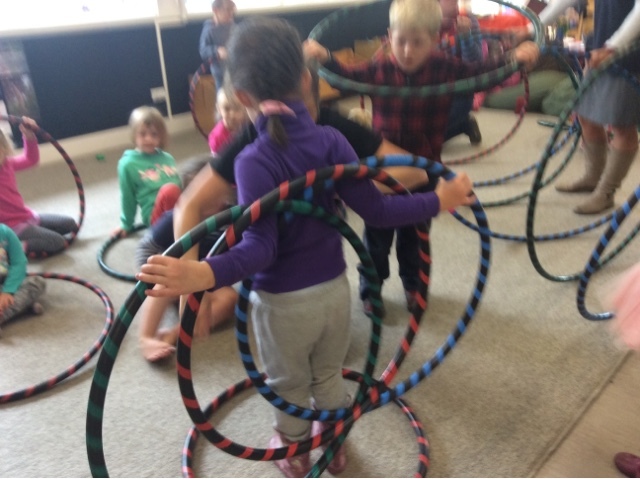 Ko te korikori tinana he pai mō te hauora - Exercise helps us stay healthy. 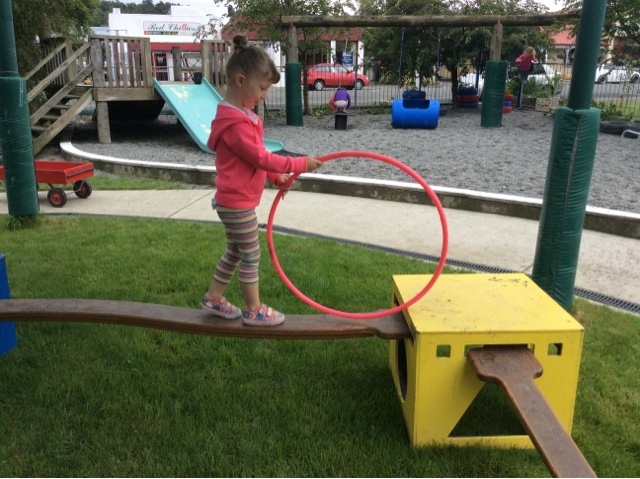 A great way for us to use our gross motor skills and help to strengthen these while having fun. 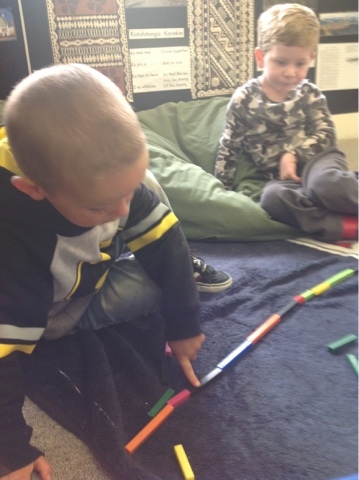 We joined in on a game pretending to be caterpillars crawling through a large tunnel, around and around. Before growing some wings and turning into a butterfly, where we used a hoop to resemble wings on the back of our arms! 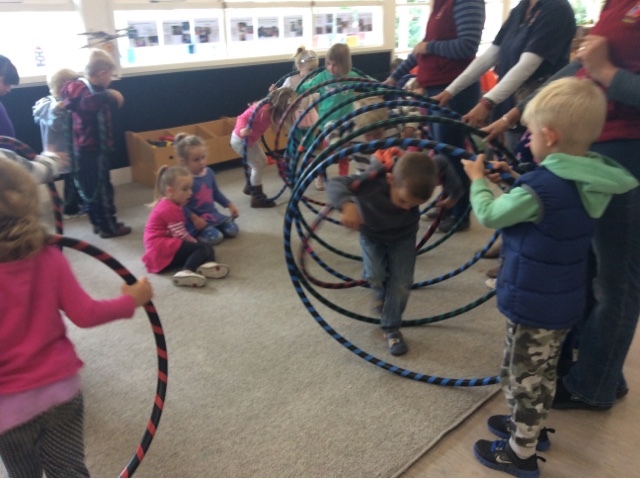 After Hoop Lady had left children enjoyed using our kindergarten hoops outside to experiment further and practise some of what they had learnt using hoops. 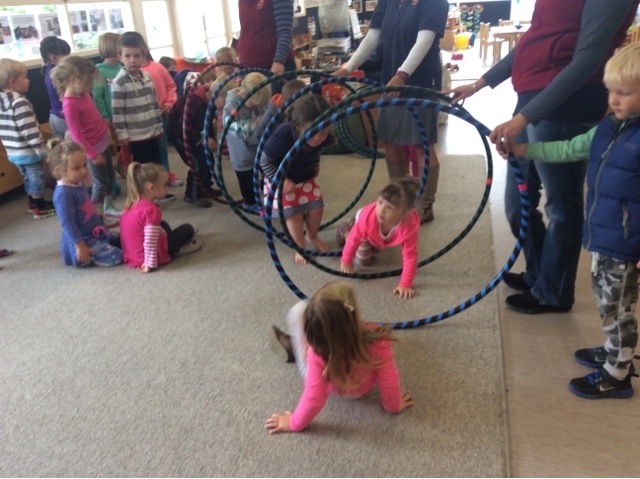 A group of children enjoyed rolling the hoops in front of them across a beam and then down the other side again. A wonderful morning persevering and being creative with hula hoops. 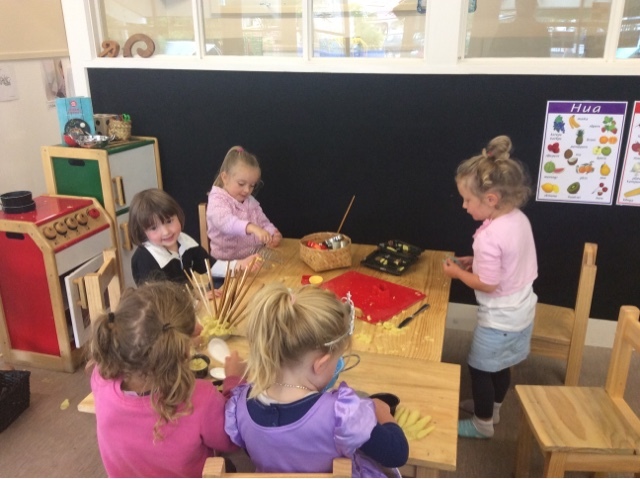 Nau mai, Haere mai, whakatau mai - a very warm welcome back to our BLOG as we begin sharing with you some of the exciting play experiences that happen at Geraldine Kindergarten each week. We have started our term with cold, wet weather but hasn't stopped the children from engaging in play both indoors and out. 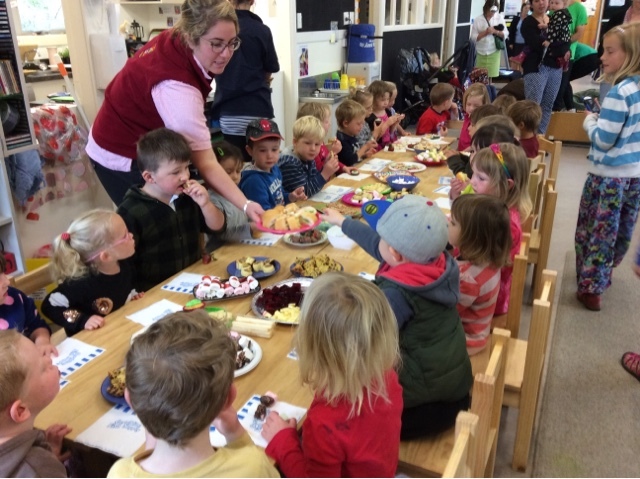 We want to share with you a range of photos from our first two days back displaying some what is important to us here at Geraldine Kindergarten. 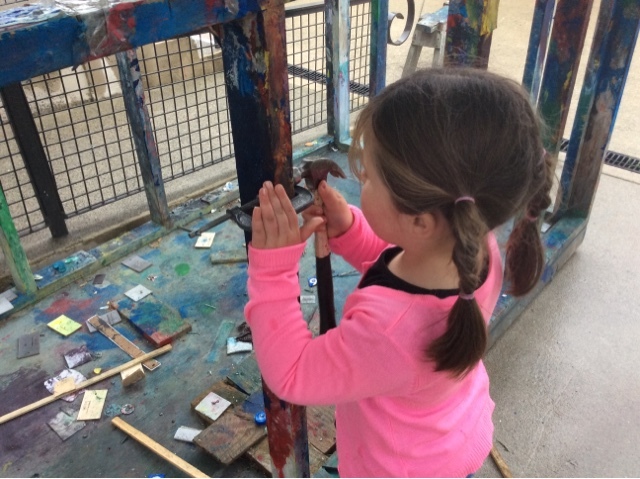 Just one photo tells many stories so we hope by sharing these photos with you, you will be able to build a picture of just some of the learning that happens here. 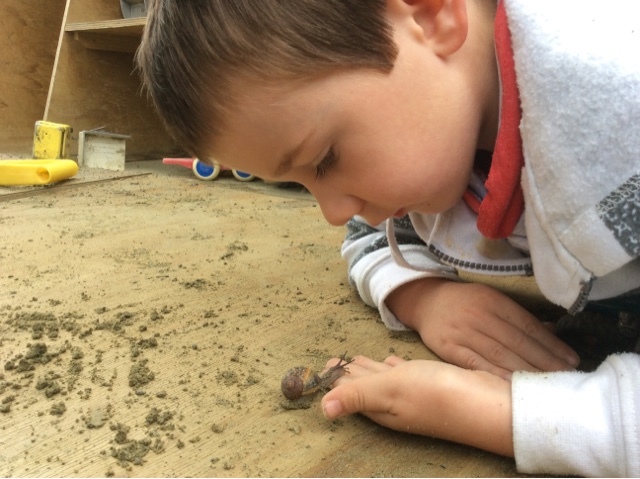 Jordan shows Manaakitanga/care and respect as holds his hand out for the snail to move onto. Alice strives for accuracy and precision as she uses a hammer to carefully bump the clamp in place. Being reunited with friends is so exciting! James and Beau took some time out to plan their next steps for play. 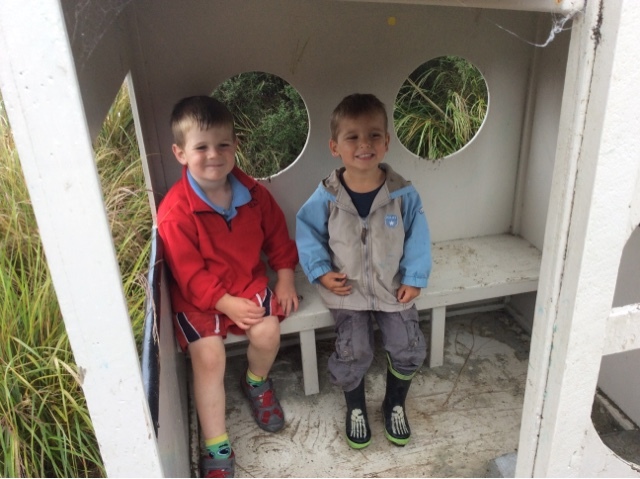 Whanaungatanga/relationships are important to our kindergarten community and seeing children re-connect with friends is very exciting. Today was out very last day at kindergarten and we celebrated this by joining together for shared kai. Children and families each brought along some kai that was enjoyed by all children around the table. Sitting together around the table allowed children and their family members who stayed to engage in converstaions while they enjoyed the food that they had brought to share. As we finish kindergarten for 2015 it is exciting to reflect on what we have all been learning this year, allowing us (children, teachers and families) to continue on our learning journey together in 2016.